The Internationally Qualified Nurse (IQN) Program (formally known as the IRON Program) is a university-based initiative that aims to prepare international nurses for Australian registration. This course recognises the high level of preparation that international nurses receive in completing their Bachelor of Nursing in other countries and takes the entry point for familiarising students within nursing in Australia. The focus is on those aspects of the practice of nursing in Australia that differs from practice in other countries. The program is made up of seven modules. The first five are online and can be completed by the student before coming to Australia. The sixth module is an intensive one week program at Monash University and the final module is a six week full-time clinical experience in an Australian hospital. The program is a bridging course recognised by the Nursing and Midwifery Board of Australia which prepares suitably qualified overseas trained registered nurses for registration with the Nursing and Midwifery Board of Australia. The next intake of the Monash IQN program is scheduled to commence in February 2019. Applications for the February 2019 intake closed on 30/10/18. Applications received before 30/10/18 will be assessed and considered for entry into the program. We have received a large number of applications for the February 2019 and applicants should receive an outcome response by 14/12/18. The cost of the IQN program in 2019 is AUD$14,950, which covers course tuition and clinical placement. Participants in the course must meet their own travel costs, accommodation costs, daily living costs and uniform costs for clinical placement. Clinical Placement may be located outside of the state of Victoria. A range of accommodation options will be supplied. Students attending the same placements are encouraged to arrange to share accommodation to reduce costs. the achievement of a passing grade for all competency assessments by the end of clinical placement. Failure to successfully complete the IQN Program will not result in nurse registration in Australia or in a refund of tuition fees. have current Police and Working with Children checks regarding their suitability to undertake such placements; (obtained after arrival in Australia, further information provided on application) and obtain relevant vaccinations and infectious disease screening tests prior to clinical placements (information provided on application). These are minimum requirements, admissions to this course are competitive and applicants may need to meet a higher requirement to be offered a place. Applications for the February 2019 intake closed on 30/10/18. Our new program, the Australian Nursing Studies (ANS) stream, is currently undergoing accreditation by ANMAC, and will be housed in two specific units (conducted concurrently in one semester) within the Masters of Advanced Nursing. Students wishing to take the ANS stream will need to meet entry requirements for the Master of Advanced Nursing and extra entry requirements which are specific for ANS. Enrolments in the ANS stream are capped and there will be an interview process for entry into the ANS stream. Students may take an early exit from the Masters of Advanced Nursing upon the completion of the ANS stream and will received a Graduate Certificate of Advanced Nursing and be eligible for registration as a nurse in Australia (subject to accreditation of the ANS stream by ANMAC). Alternatively, students may continue with their studies to complete the Master of Advanced Nursing. Please note that students exiting with Graduate Certificate of Advanced Nursing and enrolling only in the ANS stream units would undertake half of the annual full-time course load and consequently incur half of the annual full time course fee. Current indications are that the accreditation is likely to be finalised by late March and we will have the first intake into the ANS in Semester 2 2019. Looking forward, the ANS units will be taught in Semester 1 (starting late February/early March) and Semester 2 (starting mid/late July) is succeeding years. It is anticipated that admissions to the ANS stream will be competitive and applicants may need to exceed the entry requirement to be offered an interview or enrolment in the stream. Applications are now open for the Semester 2 2019 intake for the Master of Advanced Nursing (commencing 29 July 2019). Please find below course links and detailed information on the Master of Advanced Nursing and Australian Nursing Studies stream. Students are welcome to apply for the MAN and study other units pending application for the Australian Nursing Studies stream; however, they need to meet all entry criteria prior to applying for the ANS, and also be successful at interview to be offered a place in the ANS stream. Entry into this stream will be very competitive as places are limited. There is no guarantee of a place. Be able to obtain relevant vaccinations and infectious disease screening tests prior to clinical placements (see course requirements for more information) once accepted into ANS. 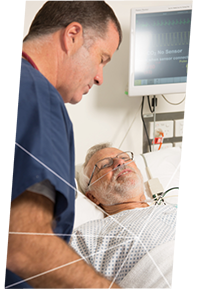 * Acute care refers to clinical health-care functions, including medical care, emergency medicine, trauma care, pre-hospital emergency care, acute care surgery, critical care/ intensive care, urgent care and short-term inpatient stabilisation (or at discretion of course coordinator).